Raffle Gifts creatively designed specifically for your Industry and your potential clients! Industry themed raffle gifts are a great way to represent your trade while also giving a gift that is one of a kind. 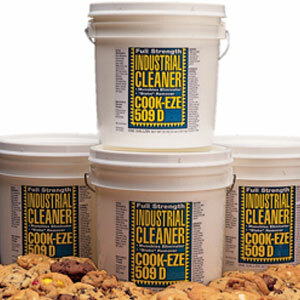 Any industry or trade, we have gifts that will get the job done. Want something more unique or custom? Give us acall today with your ideas and we will make a one of a kind product following your specifications. Our giveaway gift and themed promotional products are perfect for industry Trade Show, Conventions, exhibitions and corporate events for the Construction, Contractor, Healthcare, Law Enforcement, Real Estate, Legal and Education fields! A jumbo molded plastic, re-usable tool box filled with one pound of delicious chewy chocolate chip cookies and 11-ounces of chocolate electrical themed tools. The perfect gift for electricians and the electrical industry! This custom sturdy bucket boss reusable tool pouch is made of durable ripstop fabric. 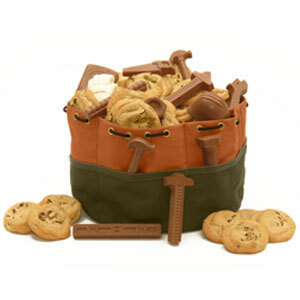 It has 2 durable fabric tool loops and 6 pockets filled with one dozen delicious chewy chocolate chip cookies and 5 - 2 oz. chocolate construction tools; chocolate hard hat, chocolate pliers, chocolate wrench, chocolate screwdriver and chocolate hammer. All wrapped and packaged with a bright red bow! Perfect for a construction or contractor company for holiday gifts, thank you gifts and more! Silk screen your logo or offered with a hang tag! This gift is 2 sweet to pass up. 2Sweet 2Build Hard Hat is a cap style hard hat, 6-point ratchet and has a pillowed brow pad and top ribbon pad for comfort and comes filled to the brim with a gourmet selection of Ghirardelli toffee bar, cookie brittle, Sonoma jack cheese, cheese spread, Godiva milk caramel, roasted almonds, bruschetta crisps and delicious better toffee pretzels. Showcase your business style with a promotional product that's cut from the cloth of two legendary American companies. Our Mini Mag-Lite (R) flashlight with stainless steel Leatherman (R) Micra (R) multi-tool set is ideal for the construction and home improvement industries. This ingenious device features spring action scissors, a knife blade, nail file, and much more in a sleek presentation box. Includes 2 "AA" batteries. *Imprint Method: Laser Engraving - Imprint Size: 1/2" x 2-1/4", 1/4" x 5/8", 3/16" x 1-1/2", 5/8" x 3/4"
Home theater club chair with slide out cooler (or storage) and cup holders. 40000 stitches of embroidery included. Dimensions: 32.28" x 28.74" x 29.13". This chair is a great display enhancer or dealer loader. 5 star rating for peace of mind. Truly a hole-in-one product, the Bushnell (R) Tour V2 Golf Laser Rangefinder is the world's smallest, yet most advanced of its kind. This device features up to +/- 1 yard accuracy and has a 1,000 yards ranging performance with 5x magnification and PinSeeker Technology (TM). Item measures 5.12" x 3.5" x 6.6.2". A great gift for executives, avid golfers and professional players. Has the complete laser rangefinder package - look, feel and performance. *Imprint Method: Printed, Unimprinted Imprint Size: 1" x .75"
Create a "maverick" promotional campaign with this unique outerwear! Made from 100% cotton with quarry washed boulder cloth canvas, the 12 oz. DRI Duck Men's Maverick Chore Jacket features a 10 oz., 100% acrylic plaid blanket lining, inside patch pockets, side-entry cell phone pockets, and adjustable-tab cuffs and waistband. Best-selling jackets wear forever! This Core product best seller is quarry washed for softness with rugged, durable construction. 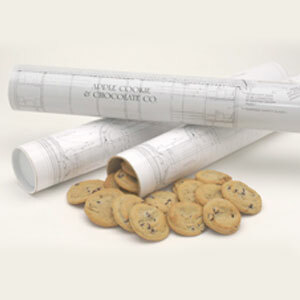 The Architect Designer Cookies are an architect's rendering rolled around a tube and filled with our delicious cookies. Choose our set assortment or all chocolate chip. Great for any job! This canvas tool bag is filled with delicious chocolate chip cookies and milk and white chocolate tools. Cookie and chocolate tool box. A reusable toolbox filled with chocolate chip cookies and milk chocolate tools. All our products are Kosher Certified OUD. A reusable toolbox filled with chocolate chip cookies and milk chocolate tools. Milk chocolate novelty tools include such tools as hammers, saws, hammers, tape measures, nuts and bolts to name a few. All our products are Kosher Certified OUD. A unique 1 gallon, plastic bucket filled with 2 lbs. of our famous, old fashioned assorted cookies. Taken "full-strength" they're great for eliminating the munchies and removing the "blahs" when they strike. A reusable retro style lunch box filled with our famous chocolate chip cookies and milk chocolate tools. All our products are Kosher Certified OUD. Shop More Industry Themed Prizes!